There's lots of fun historic stuff to see and do in Nottingham, and here's our pick of the best things to do. However, don't expect a fancy castle like you saw in Prince of Thieves (they shot that in France). The largest surviving square in the UK, the heart of Nottingham for centuries, and a good place to explore from. Tip: walk from here up Friar Lane, across Maid Marian Way to the castle. Our historic castle was destroyed in 1649 and replaced by a grand mansion, but it’s well worth a trek up castle rock to see the views of the city, explore the gardens, and visit the exhibition galleries. The Robin Hood statue is just beside the impressive gate. 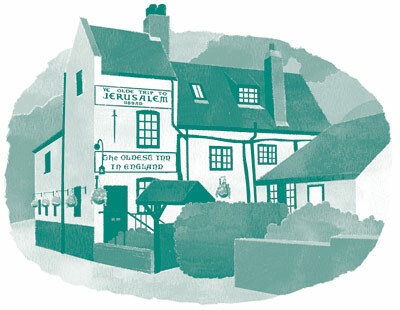 England’s oldest pub is a must-see. It’s pretty in a shambolic way, and is built into caves. The beer is great, the model ship is cursed, and Quentin Tarantino loves the place. Really. This museum reflects centuries of Nottingham life through excellent exhibits (and it’s a very photogenic spot). At the foot of the castle cliffs, near Ye Olde Trip. Nottingham is famous not just for men in tights, but also for the huge cave system under our feet, and it’s worth taking time to explore this lost underworld. Access via Broad Marsh shopping centre at the end of Bridlesmith Gate. In the 18th/19th centuries Nottingham sold its lace all over the world, bringing wealth to the city. Look for the distinct old warehouses of Stoney Street and Broadway, and stroll around High Pavement and St. Mary’s church. Also on High Pavement, this impressive building houses an interactive museum of crime and punishment. It’s an historic site where an individual could be arrested, sentenced and executed. The original theatre facade is wonderful (best approached by walking up Market Street from the square), and just about all that’s left of our old theatre district. Now part of The Royal Centre. A short bus or taxi ride south of the city centre, but worth it to stroll along the river banks, or check out our three sporting grounds: the City Ground (Nottingham Forest), Meadow Lane (Notts County), and Trent Bridge cricket ground. The famous Playhouse is rich in theatre history, and outside is Anish Kapoor’s Sky Mirror which is mesmerising and a recognised danger to pigeons. Topped by a great multiplex cinema, you’ll find plenty of food options here, such as Wagamama, Nando’s, TGI Fridays, Pizza Hut, Red Hot World Buffet, and the excellent Rocket at Saltwater (with it’s rooftop views). Sherwood Forest actually exists. Well, a bit of it still does as most has been swallowed by the modern age. The visitor centre is fun, and there are great forest trails and bike hire. It’s a 30 minute bus ride away. It’s worth getting a bus or taxi to Wollaton Park. There's a heritage museum, beautiful grounds, a big lake, decent cafe, and roaming deer. As seen in The Dark Knight Rises movie.